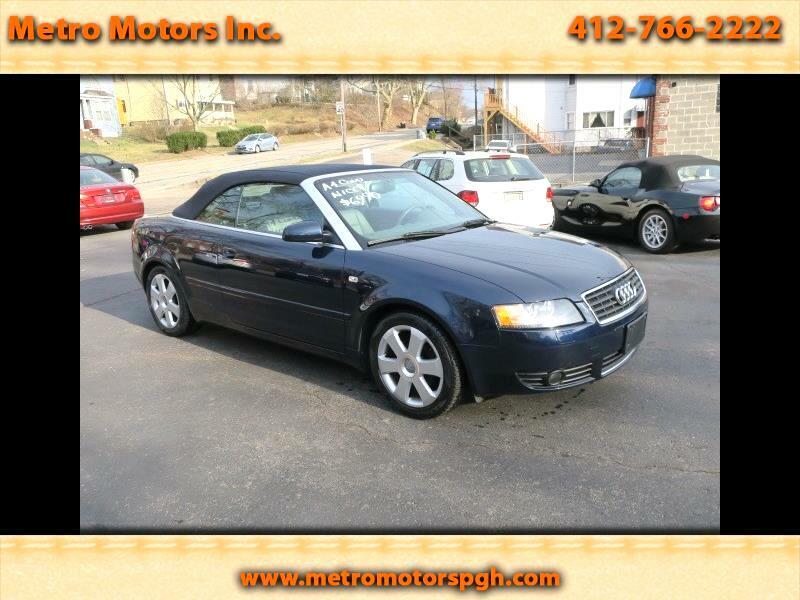 Super Nice 2004 Audi A4 Convertible!! This garage kept beauty looks and runs Fantastic. It has had awesome service history and it shows, Have Service Records! Finished in Moro Blue Pearl, Nautical Blue Canvas 1-Touch Disappearing Convertible top, Dove Gray Leather Interior. Power, Heated, Leather Seats. Dual Zone Climate Controls. Leather Tile & Telescopic Steering Wheel. Cruise Control Traction and Stability Controls. Premium Sound w/CD. Automatic Head lamps. Xenon HID Head Lamps. Glass Rear Window with Electric Defogger. 1.8 4 Cylinder Turbocharged engine has great performance, yet get Great Fuel Mileage!! Automatic Transmission. Service Record Showing Recent Major Service include Timing Belt Service!! 17 Inch Sport Alloy Wheels on Brand new Tires! Just Service, Inspected, Smog Tested. Ready for your enjoyment! You won't find a nice A4 Convertible, and at a very attractive Price! !